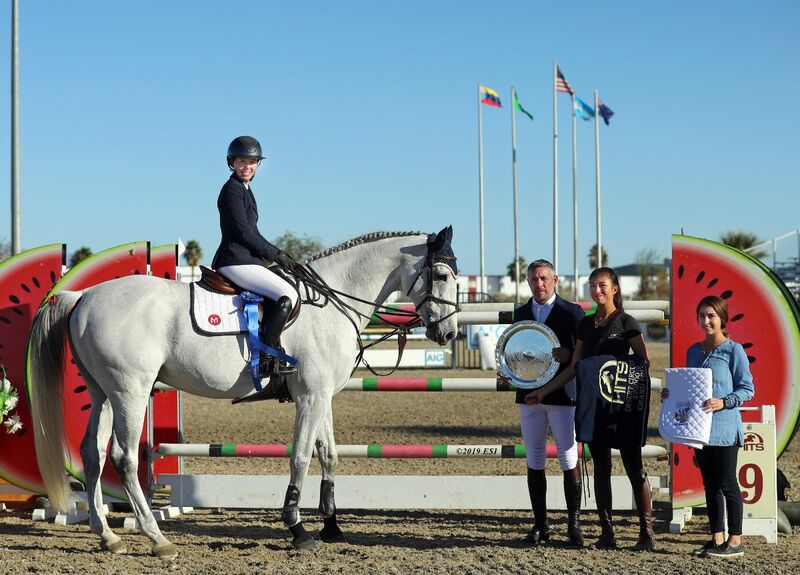 HITS » In Case You Missed It: Uma O'Neill and Jenny Karazissis claim top honors during Week III of the HITS Coachella Desert Circuit! 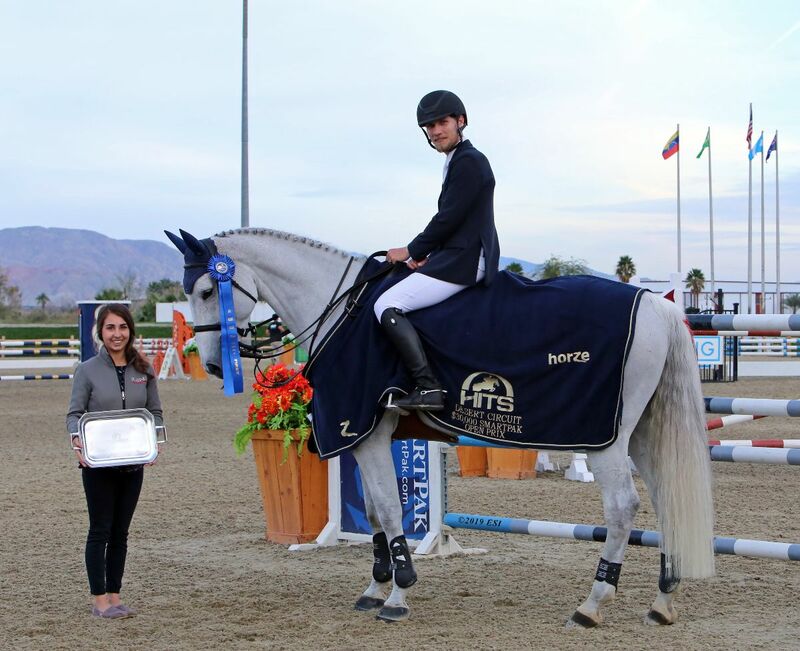 In Case You Missed It: Uma O'Neill and Jenny Karazissis claim top honors during Week III of the HITS Coachella Desert Circuit! 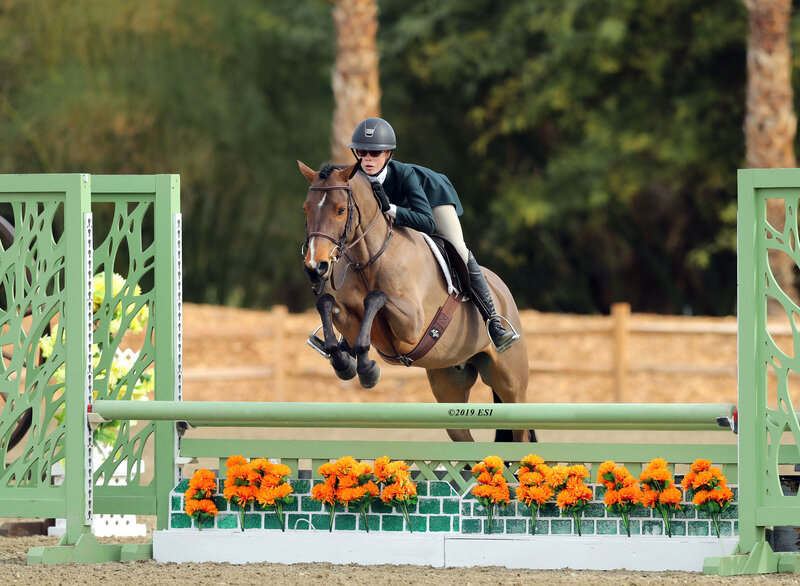 More blue ribbons and champion titles have been awarded at Week III of the HITS Coachella Desert Circuit, and competition heats up as the Back on Track Mid-Circuit Champion Awards are presented next week. Cassio Rivetti and CARLO jumped into Desert Circuit III with a win in the $5,000 Johnson Horse Transportation Open Welcome, in a time of 33.081. 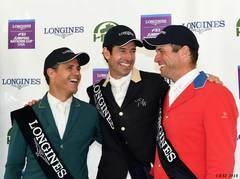 Karl Cook (pictured to the right) led the field in the $30,000 SmartPak Grand Prix, taking home first in a time of 39.856 aboard CAILLOU 24. Dean’s second place finish also secured her first Place in the $1,000 Charles White Hay Sales U25 Classic. Simpson would take home the blue ribbon aboard LADY MARGARET ZF in the $10,000 Summit Joint Performance Jumper Classic, racing through the timers in 29.592. 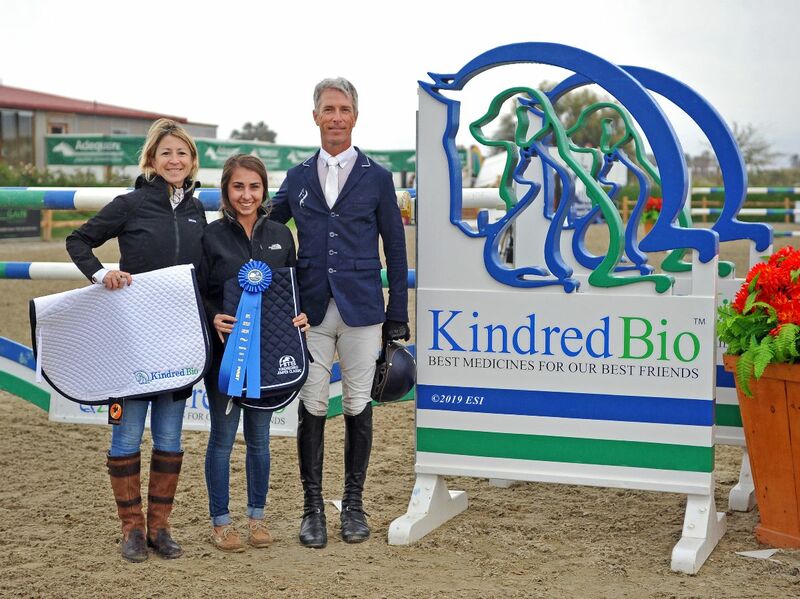 Taking home top honors in the $15,000 KindredBio Jumper Classic was Richard Spooner (pictured below) aboard LOVE, in a time of 36.646. Jake Cheikha & CAGOLDAS finished first in the $3,000 Junior 1.20m Jumper Classic, with Lauren Kee & BLACK IRISH taking home the blue ribbon in the $3,000 A-O/Am 1.20m Jumper Classic. Taking top honors in the $5,000 Jr/A-O/Am 1.35m Jumper Classic was Dean & MARY POPPINS. 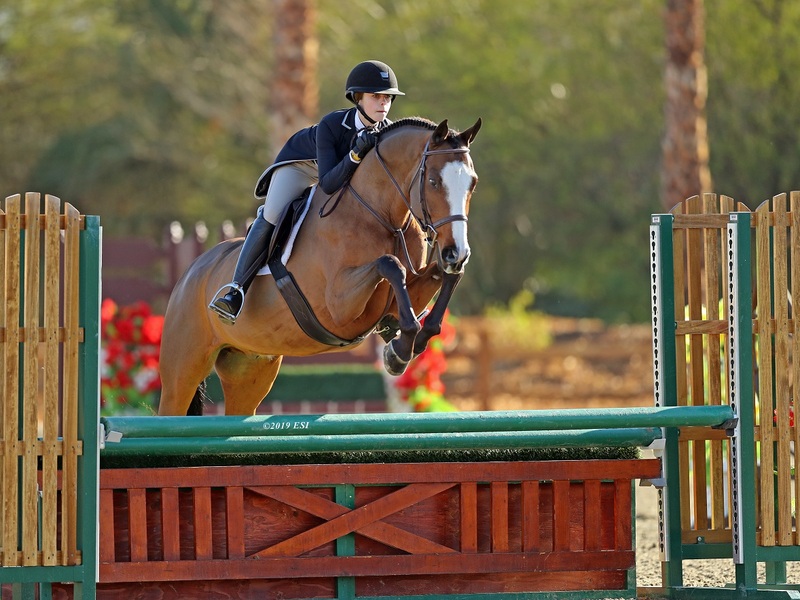 Uma O'Neill & SANVANO took the blue ribbon in the $10,000 Jr/A-O/Am 1.45m Jumper Classic. O’Neill added to her already successful week with a win in the $70,000 HITS Grand Prix aboard CLOCKWISE OF GREENHILL Z. O’Neill was fast and clean in a challenging jump-off, crossing the timers in 45.047. Blue ribbons and qualifying points for the HITS Championship were awarded in the Platinum Performance and Devoucoux Hunter Prix that took place on Friday. Qualifying points can be accumulated throughout the year towards the HITS Championship that takes place each September in Saugerties, New York. Standings are updated on HitsShows.com each week! Avery Glynn (pictured below to the left) and KING OF HEARTS took top honors in the $1,500 Platinum Performance Hunter Prix. Glynn’s scores of 86 and 89, in her respective rounds, for a total of 175, secured the blue ribbon in the Prix. Jenny Karazissis (pictured below) had a one-two finish in the $5,000 Devoucoux Hunter Prix. Karazissis was awarded scores of 86 and 87 aboard BUNISTAR for a two round total of 173. Desert Circuit III also featured the first of two USHJA Pony Hunter Derbies offered this year, with Skylar Wireman (pictured above to the right) taking home top honors aboard HALF MOON BAY with a pair of 87's to total 174 for her efforts in the class. Another exciting week of show jumping competition lies ahead at the AON HITS Desert Horse Park. For a complete listing of results, head to HitsShows.com. Follow all of the excitement on social media or watch LIVE on ShowHorse TV! Copyright © 2019 HITS, Inc., All rights reserved.